Oppo F3 outperforms other midrange smartphones in Php 15K-20K segment. It covers 48.5% of sales. The Oppo F3 covers 48.5% of the Philippines' smartphone sales in the Php 15,000 to Php 20,000 mid-range segment in May 2017. 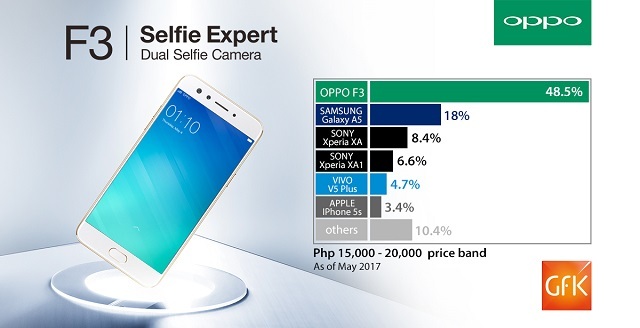 GFK reports that Oppo F3 claims the No.1 spot in the said price category with Samsung Galaxy A5 coming far second at 18% and Sony Xperia XA in third place with 8.4%. The Oppo F3's edge in the mid-range segment is its unique dual-selfie camera feature, sleek body and attractive package. This feat jumpstarted last May when the Oppo F3 sold 22,000 units in its first three days of availability. Likewise, Oppo remains the No.2 smartphone brand in the Philippines. Oppo released the F3 Black edition last June 13 adding additional options from the Gold and Rose Gold variants of the handset. The company also slashed the price of the handset to Php 15,990 with its "Back to School" promo until July 31. New Oppo F3 units comes with pre-installed transparent case and soft transparent case.